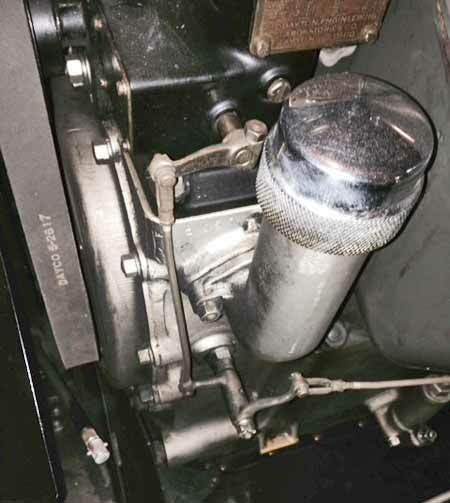 Even though your engine may be antique, that doesn't mean it can't be a great performer. Good engine performance is accomplished, among other things, by good valve timing, proper carburetor mixture, and accurate ignition timing. 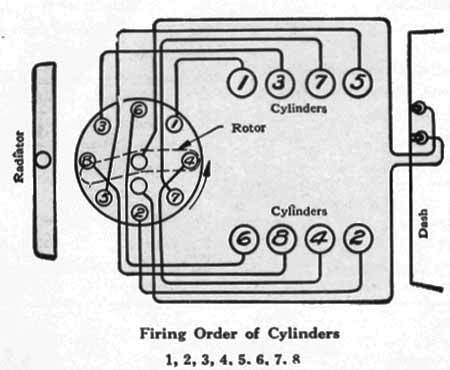 Photo 1 — Top view of the distributor and the cylinder numbering. Note that if the rotor is adjusted clockwise then the timing would be retarded. Manufacturers like Lincoln outlined a timing procedure in their Owners and Service Manuals that uses the ammeter and rotating the crankshaft to reflect the point when the breaker points have opened on each of the two ignitions (aka the continuity method). The continuity method is good for a rough adjustment to get the car started, but rather than relying on this tedious procedure for accuracy, we suggest a more convenient and accurate method using a timing light to verify or adjust your dual point ignition timing. As shown in the before and after pictures, there was a very noticeable difference in engine performance when the timing was set using a timing light versus continuity. Note: The following steps were applied to a Lincoln, and assumes that the car has distributor plates that are adjustable. However you should be able to adapt them to your specific auto. Keep in mind that some early cars had both sets of points fixed in position. Setting the left bank relative to the right was done by bending the point arm or adjusting the point gap. Familiarize yourself with your specific ignition system and know how to make the necessary adjustments. The article also assumes that the ignition advance system (as applicable) is assembled correctly and operates smoothly. Photo 2 — View of the bell crank and control rod linkage used on the model L Lincoln advance. Make sure the bell crank is mounted correctly with the shorter arm connected to the distributor and the longer arm to the gear at the base of the steering wheel. Verify the distributor advance linkage moves freely and through its full travel. 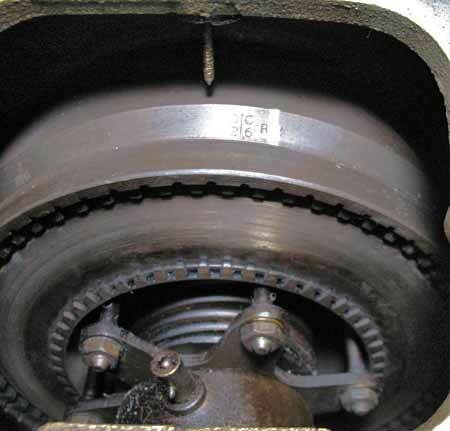 Step 1 — Familiar yourself with the flywheel timing marks on the clutch ring as shown on Photo 3 by reviewing the literature of your specific ignition system. Note where certain marks are located and the ones adjacent to them. Note the marks before them to reaffirm when relevant timing marks (R1 & R2 in this case) should be coming into view. 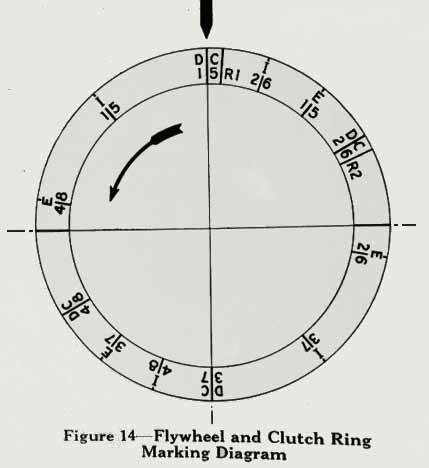 Photo 3 — Diagram of the timing marks shown on a clutch ring gear for a model L Lincoln. The location and marking legend for your ignition will be different. Photo 4 — Front compartment with the floor boards removed revealing the ignition timing marks on the flywheel under the clutch cover. 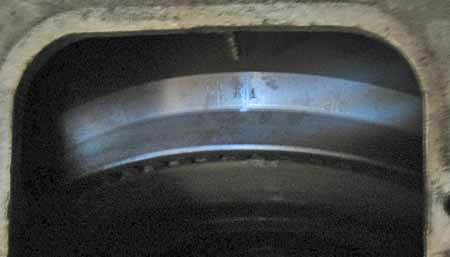 Step 3 — Remove the any inspection cover(s) over the clutch area or the cover where your timing marks are located for your specific system. Step 4 — Remove any additional access covers that may help you move the flywheel to identify pertinent markings. In the case of Lincoln, the access cover over the flywheel swings out of the way. Step 5 — The ring gear is likely to have a light coating of oil and dirt and some letters & numbers maybe hard to read. Suggest cleaning the entire surface using a rag and solvent. Use some steel wool to rub against the clutch ring to identify the timing marks. Again familiarize yourself with the markings on the clutch ring note where the markings are located. 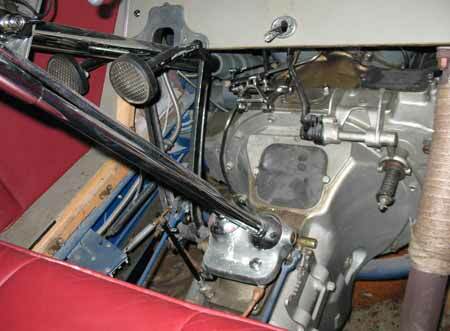 Rotate the engine by either the hand crank or moving the flywheel via the access covers. Mark them with a thin line of enamel paint (Photo 5). Suggest using white paint on one mark and bright yellow or orange on the other mark. This will help eliminate any confusion on which mark is being illuminated under the timing lights flashes. Allow paint to dry. Photo 5 — Mark the flywheel timing marks with bright paint that will be highly visible under the timing light's short flashes. A lesson suggests using white paint for the first mark (R1) timing mark and a different color like fluorescent orange for the second (R2) timing mark. Using different colors ensures confidence on which timing mark is being illuminated. Step 6 — While the paint is drying, remove ignition wire loom covers (if applicable) on each side of the distributor cap. Unsnap the Distributor Cap and gently allow the cap to hang back of the Distributor unit. Gently remove the rotor (upward). Hand crank the engine over until one of the sets of points is on the high point of the four-lobe cam. Set the points to its proper gap (0.020 for Lincoln). Then crank and set the other point at the top of a lobe and adjust to them as well. Note: as the point arm phenolic wiper wears, the point gap will gradually close changing the timing. The actual timing may be correct once the point gap is set properly. 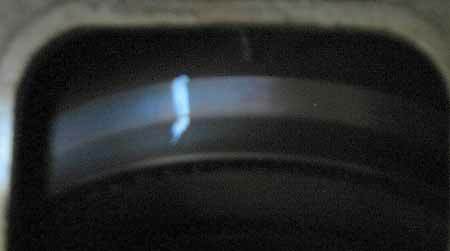 Set the point gap for your specific ignition system. Lincoln used points that screwed in and out and held with a lock nut. On cars that have been sitting a long time, the points often corrode and prevent a proper contact. Make sure the points are clean. If replacing the points, note that the phenolic wiper will wear rapidly at first and you may have to reset the timing after just a few miles. Also, put a tiny touch of (non-offgassing) point grease on the lobes. Reassemble the rotor and cap. Leave off the spark wire covers — for this process, the cap may have to come off many times. Step 7 — Connect the timing light to the suitable power source, likely 12 Volt DC or 110 Volt AC (follow the timing light instructions). Connect the sensing clamp around the #1 cylinder ignition wire (at the spark plug). In this case it is the front cylinder on the passenger (right) side block (Photo 1). Take extra care on routing of the timing light's power and sensing cables avoiding excessively hot or moving parts. The last thing you want is to have your timing light cables caught up in a fanbelt. Step 8 — Manually retard the ignition control (usually on the steering wheel) to the fully retard position. Start car as normal and allow warming up and idle at its lowest RPM. 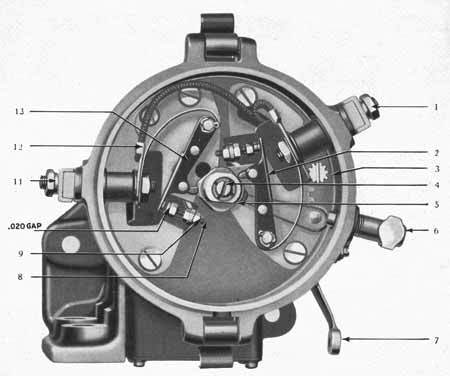 Step 9 — Aim the timing light at the clutch ring and note the location of the white mark (designated as R1). Note the position. Since the engine turns clockwise as seen from the front of the car, it will be counter clockwise as seen through the transmission cover. If the mark on the clutch ring has not yet reached the pointer i.e. to the right, then the spark is happening early. This actual example shows the white mark illuminating to the right of the center pointer (Photo 6). Note: If your timing light is equipped with an advance knob, ensure it is set to zero degrees. Photo 6 — The first (R1) timing mark as adjusted per the manual using the continuity method. The timing light reveals it to be advanced by about 15 degrees. Step 10 — Turn the engine off and unsnap the Distributor Cap and gently allow the cap to hang back of the Distributor unit. Gently remove the rotor (upward). Step 11 — Adjustment is made by unscrewing the lobes' tension shaft screw (just enough to permit movement of the lobes, do not remove all the way) advancing the lobe under the distributor cap (Photo 7). As seen from above, the rotor turns counterclockwise. Adjusting clockwise will retard the timing later (Photo 1). Suggest using an open end wrench to provide a good means to adjust the lobes to even the slightest amount. Note: the direction of adjustment can be confusing. Make small adjustments and note the change with the timing light. If you turn the point cam too much, the car might not run. Photo 7 — Top view of a dual point distributor head assembly. Screws secure the plate and in the case of DELCO, an adjusting gear provide for fine adjustments and a single screw under the rotor secures the cam lobe. Your configuration will vary slightly but the same concept should apply. Step 12 — Reassemble the rotor and cap and restart the car. Illuminate the mark again and note the new position. Continue to adjust the rotor lobe until the white mark is within Â¼ inch of the center pointer (Photo 8). Don't forget to tighten the screw in the center of the point cam when done. Photo 8 — The ignition points are adjusted per the above procedures for the first (R1) right side block. The white painted mark should be directly under the center pointer. Step 13 — Place the timing light's sending clamp on the #2 cylinder ignition wire (cylinder closest to the firewall on the drivers (left block, Photo 1). Step 14 — Illuminate the second (R2) timing mark and note its position in relation to the center pointer. A position to the left of the pointer (Photo 9) means late timing and the points breaker plate under the distributor cap needs to be adjusted. Photo 9 — While the picture is a little out of focus, the timing light reveals the second (R2) timing mark (adjusted using the continuity method) to be retarded (late) by about 8 degrees. Step 15 — Turn off the engine and remove cap and rotor per step 10. Loosen the moveable breaker point plate screws and advance or retard the points as needed. Tighten screws and reassemble rotor and cap. The DELCO system adjusting gear is a screw that has teeth on it. Turning this gear screw will move the left bank points relative to the right bank which is now fixed (by tightening the center screw on the point cam.) Moving the point plate in a counterclockwise direction (the direction that the rotor turns) will make the spark occur later. Between each adjustment, retighten the two fixing screws. If they are a bit loose, the gap on the points can be effected, thus also changing the timing as well. Keep in mind that the distributor is a precision instrument and do not over tighten the screws. Step 16 — Restart car and again ensure the ignition control lever is in the fully retard position. Illuminate the second mark. As with the first timing mark (R1) timing mark, the second (R2) should be within Â¼ inch of the center pointer. Adjust as necessary. Step 17 — Recheck R1 and R2 timing marks to ensure nothing as changed. Reassemble ignition loom covers. 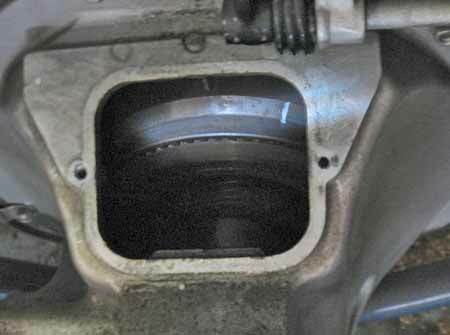 Step 18 — Since the floor boards have been removed, this is a good opportunity to lubricate certain items like brake and clutch pedal bushings, brake linkage, the clutch throw out bearing, throttle linkage and even inspect the transmission fluid level. Install floor boards. Properly adjusted ignition timing is critical for good engine performance. Your results will prove that the use of the timing light method is clearly more accurate than the procedure in the Service manual. Before performing this procedure, inspect the condition of the ignition wires especially as they enter and run through the looms (if applicable). Observing the running engine at night might reveal arcing not otherwise noticed. Also ensure the points are smooth and not pitted. Pulling up the floor boards to perform this procedure permits inspection and maintenance for certain tasks. When making adjustments inside the distributor, make these adjustments in small increments and note the results.